New welcome signs were installed early this week at the highway entrances to Albion. Monument-syle signs were installed on the Highway 14 north entrance (above photo), and a double sign was located on the north side of the Highways 14-39 junction southeast of town. New signs were also installed on the existing posts at the east and west Highway 91 entrances. 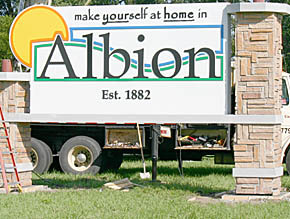 The signs are a project of the Albion Economic Development Corp., and are designed to match the new Albion logo. 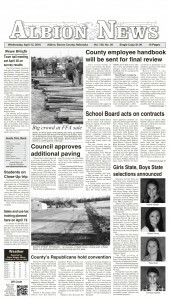 The cost was paid with city sales tax funds earmarked for economic development, and with funds from a Mansfield Foundation grant. The date on the bottom of the signs (est. 1882) is the year Albion was first incorporated by the State of Nebraska.